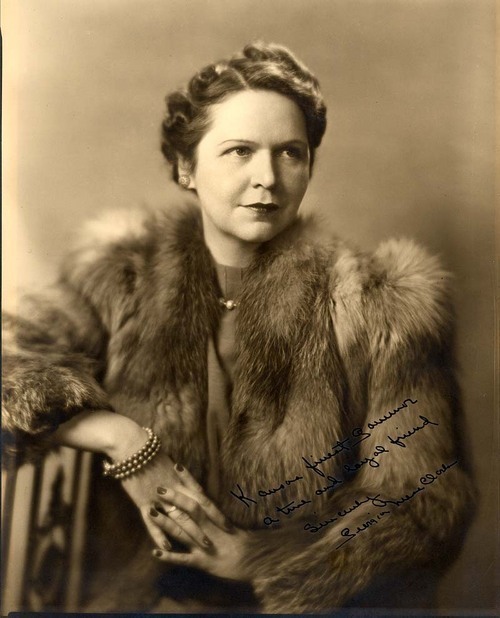 This is a signed studio portrait of Georgia Neese Clark Gray, 1900-1995. Gray was National Committeewoman for the Democratic Party, 1936-1964. On June 9, 1949, President Harry S. Truman appointed her as the first woman to serve as the U. S. Treasurer. She served from 1949-1953. She was born in 1898 in Richland, Kansas, to Albert and Ellen Neese, Gray attended school in Topeka and graduated from Washburn College in 1921. During college, she developed an interest in acting and after graduation attended the Franklin Sargent School of Dramatic Art and spent nearly ten years acting with various stock companies. She married her manager, George M. Clark in 1929. They divorced in the mid-1940s. She started working at her father's Richland State Bank as an assistant cashier in 1935 and became president in 1937 following his death. She became active in the state Democratic Party and was elected National Committee Woman in Kansas in 1936, a position she held until 1964. She was an articulate and well-liked representative of the party and an early supporter of Harry Truman. It was this support that brought about her nomination as the first woman to be Treasurer of the United States. She served in that office from June 1949 until January 1953 when Truman left office. This is a signed studio portrait of Georgia Neese Clark Gray, 1900-1995. Gray was National Committeewoman for the Democratic Party, 1936-1964. On June 9, 1949, President Harry S. Truman appointed her as the first woman to serve as the U. S. Treasurer. She served from 1949-1953. She was born in 1898 in Richland, Kansas, to Albert and Ellen Neese, Gray attended school in Topeka and graduated from Washburn College in 1921. During college, she developed an interest in acting and after graduation attended the Franklin Sargent School of Dramatic Art and spent nearly ten years acting with various stock companies. She married her manager, George M. Clark in 1929. They divorced in the mid-1940s. She started working at her father's Richland State Bank as an assistant cashier in 1935 and became president in 1937 following his death. She became active in the state Democratic Party and was elected National Committee Woman in Kansas in 1936, a position she held until 1964. She was an articulate and well-liked representative of the party and an early supporter of Harry Truman. It was this support that brought about her nomination as the first woman to be Treasurer of the United States. She served in that office from June 1949 until January 1953 when Truman left office.